Saga of the Nine Worlds: The Four Stags is rated 3.2 out of 5 by 14. Rated 5 out of 5 by Yanie1020 from What's With the Bad Reviews? I thought this was a great game, and I've played a ton of them. The graphics are outstanding, voiceovers are very good, and we aren't inundated with hidden object scenes. Puzzles could have been a little more challenging but I still enjoyed them. I certainly don't understand the bad reviews at all. Rated 5 out of 5 by siladan from One of the few series that merits a CE purchase This is an exciting, innovative series based on Norse mythology. The graphics are crisp, clear, and beautifully done. The music is haunting and thematically appropriate, and there were no technical issues when downloading or playing. Game-play is interactive and immersive. Hidden object scenes are somewhat different and unique at times. The puzzles are playable, even for a puzzle hater like me. This game is all about the story and the story remains fairly true to the subject matter. The few small variances didn't detract from my enjoyment, and I'm a Norse mythology enthusiast. Google Yggdrasil and the White Stags for information on how the stags groom the tree and any other questions related to the mythology in the game. The Four Stags deserves a CE purchase, as does the previous game in the series. I finished the SE demo and decided to purchase the CE version, like another reviewer did. This has only happened a few times in the years I've been with BF, with the Vermillion Watch series, The Dead Reckoning series, Paranormal Pursuit, and the new Dark City series. Quality construction, imaginative story-telling, and attention to detail will get my money every time. That's why I purchase so few games anymore. Most of the offerings are rehashed versions of the same, tired ghost/ghoul/witch/demon stories that have been done to death. Fortunately, this game soars above the dross and is worth my time and money. Rated 5 out of 5 by biscuitsmama from THIS IS WHAT HAPPENS WHEN THE SEQUEL IS BETTER THAN THE ORIGINAL GAME When Saga of the Nine Worlds the Gathering was released I was excited to see a new series; however that hope quickly dwindled as I got into the actual game. So when I saw the beta for The Four Stags I asked myself why this developer even bothered to continue the series when the first game was so bad. Fortunately, the developer did continue with game two in the series, The Four Stags, which, IMHO, is so much better than the first game. Yes, once again the game starts off slowly with quite a few mundane tasks to complete before it picks up momentum but it is worth slogging through all of those tasks because once the game gets going it is very, very good. It’s funny because when I tried the beta for the game I wasn’t sure about it since I didn’t care for the first game, but now playing the full game of The Four Stags I am finding that I love it. So what changed? For one thing in the HOP scenes the items are so much easier to find than they were in The Gathering. The items are still well hidden but they are a bit larger and not so monotone which makes them a bit more visible. Although the first HOP scene is covered in old and dusty cobwebs I could still spot the items. Subsequent scenes are even better with more color, which is a great step up from The Gathering. I am not going to jump into the storyline in this review because others have already done that but I will say that I like this storyline much better than the one in the initial game. The graphics, at least to me, also seem much better and I love the beautiful fantasy realms created by EIPIX. I’ve already mentioned that I think the HOPS are so much better in this game, and even though the puzzles seem easy I know that there will be tougher puzzles ahead. I’m hopeful that as the game progresses the difficulty of the puzzles will as well, which is generally the case in most games. I am hoping that I might run into a couple of super-puzzles later in the game. I am sure that many gamers will enjoy this game because it seems to be more of an adventure, quest type game than my favored HOPA type. Even though this game may not have as many HOPS or puzzles, I am thankful that this game is so much better than I anticipated. 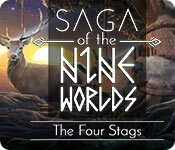 Even though this game is one that I really enjoy, as always, I suggest that you try the demo to see if Saga of the Nine Worlds The Four Stags is a game you will enjoy as well. Happy gaming! Rated 4 out of 5 by yowzasma from MINI REVIEW "Saga of the Nine Worlds: The Four Stags" for JUNE 15, 2018 I enjoyed playing this surprisingly good game & agree with the positive reviews ny Fellow Fishies have written :) ♥ And if you are contemplating getting this I don't think you will be disappointed :) Graphics' colors' music and sounds, story-line and general gameplay are fine. I do wish there were more hidden object scenes but I survived okay.. One other gripe is for the Dev's about letting us know what is expected when we play a Mini-Game. Rated 4 out of 5 by deddu from LOVED THE ADVENTURE This is a good adventure game with lots to do. There are a variety of mini-games which I loved. To save the nine worlds you must travel through them and save the stags. You get to kill the dragon at the end. Rated 4 out of 5 by skullfun from SAGA OF THE NINE WORLDS GOES FROM CE TO SE IN LESS THAN A MONTH? I liked the first Saga of the Nine Worlds enough to be excited for this sequel, but I was concerned with the slow-paced storyline which may explain why this SE was released so soon. At first, The Four Stags seems to suffer from this same problem. The beginning of the game was sluggish, with an overwhelming amount of recaps from the first game. However, once the game picks up its speed, it is simply wonderful. The game has you playing as four different characters, as each member of the Odin’s army splits up to find each of the four stags. The landscapes of the game are always changing and so is the feel of the game, which makes this sequel all the more interesting. Saga of the Nine Worlds: The Four Stags is also one of Eipix’s best-looking games. The visuals are spectacular; the details of the artwork are mind-blowing and the fantasy special effects are extravagant and glorious. The audio aspect of the game is also worth mentioning. The background music remains quite subtle most of the time, but the variety is definitely appreciated and they do accompany the scene extremely well. The highlight here are the voice-overs, which are exceptional. They perfectly portray the personality of their respective characters, while not being over-the-top or unpleasant. 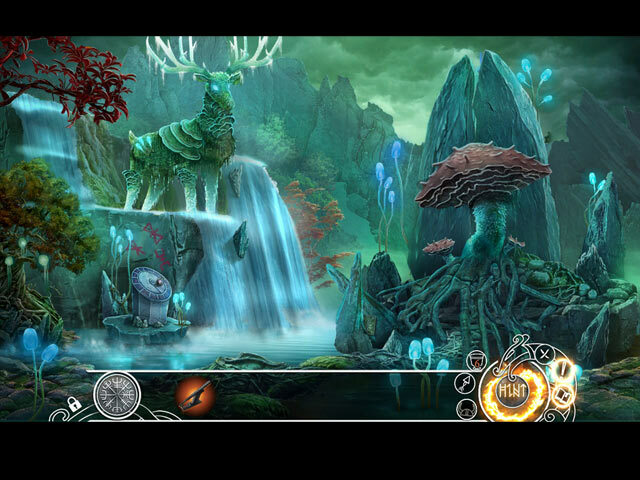 If there is one thing that Saga of the Nine Worlds: The Four Stags can improve upon, it is the challenge level. Unlike most Eipix games, the gameplay here is actually quite complex, thanks to the insane number of tasks to do in each scene. 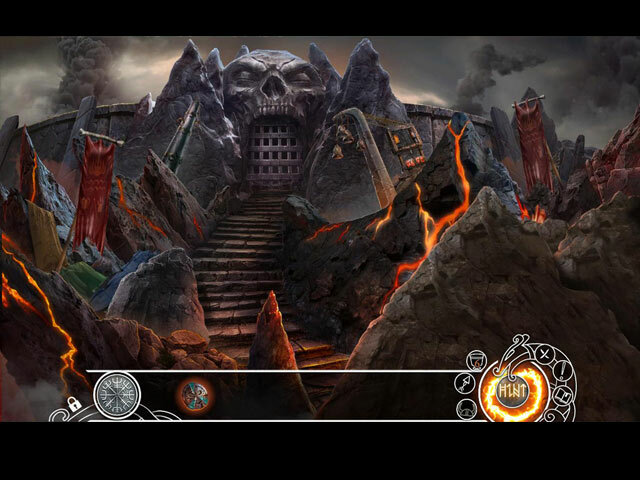 Rather, the hidden object scenes and the puzzles are the weaker aspects. 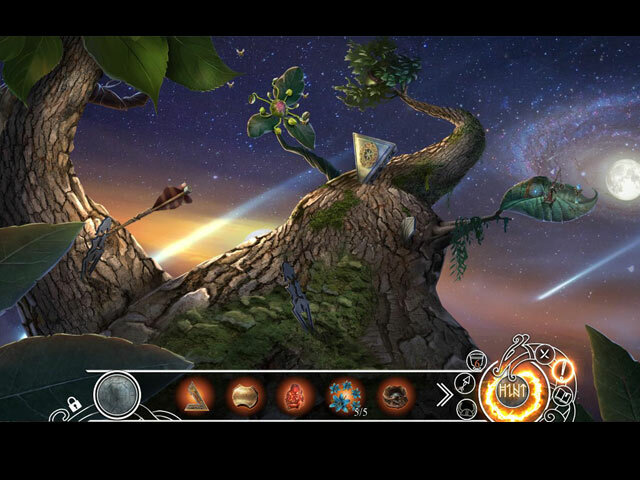 The hidden object scenes do not break any new grounds and the puzzles are fairly easy despite their promising concepts. Still, there is no denying that the puzzles are still very entertaining and well-integrated into the storyline. Surprisingly, Saga of the Nine Worlds: The Four Stags is also a long game. The game took me over four and a half hours to complete on the easiest difficulty setting, and the bonus chapter took just over another hour or so. I played the Collector’s Edition which comes with a plethora of perks; a strategy guide, wallpapers, characters, concept art, videos, soundtracks, re-playable mini-games, replayable hidden object scenes, a souvenir room, achievements, collectibles, and morphing objects. If I knew this would be offered in the SE version so soon I wouldn't have purchased the CE; I would have used a free game coupon. Cheers! Rated 3 out of 5 by campingramps from I like the series but this one is slow I've played most of this series and, to me, they have all been buys, however, this may be the first non buy in the series. Although the graphics and colors are great the story and getting through it are not. Seems to take forever to get past an area and then you have to come back to that same area later. Very frustrating to say the least. HOs and mini games are ok although not great and I enjoyed playing them. I like my HO games to move along and not falter or stay too long in one place but, because this one does that it only gets 3 stars. Still, I enjoyed the demo and recommend the game. I may buy it just to have all of the series. Rated 2 out of 5 by BooksandGameFan from Horrible game! I use to be a big fan of Eipix games but over the past year or two, I've avoided playing most of their games because I start out liking them in the demo but right after you purchase them they go down hill and because there are way too many moments of what the heck? Where you do things that make no logical sense. This game was like that! I also hate ruins or symbols that you have to find and this game has that in overabundance. I demoed the game and it seemed creative, fun if not a bit on the harder side which is okay with me and I read that the scenery was beautiful etc. So I said what the heck and bought the game. First, let me say no the scenes were not beautiful as far as I got in the game which was two of the 4 places you had to travel to. A rundown, rock filled area, a rundown lava filled area is not beautiful in the least! I used the hint more times then I have in 5 games put together in the 2 hours of this game that I did play and finally I came to a game that you could not skip nor could you play because you were not given enough information to actually play it and I wasn't going to spend an hour trying to come up with different combinations of numbers until I hit on the right answer. I deleted the game at that point. No I do not recommend this game. Rated 2 out of 5 by beaglesrock from Get Ready to Use the Hint Button I found the story a little confusing because there are so many different characters. It would probably help to play the first game right before this one so the characters are fresh. I played the game without sparkles in the active areas. It would not have mattered, because you know something needs to be done in the scene, just not what needs to be done. The biggest problem is that nothing is intuitive in the game. You have no idea what should go together. Some things you find are labeled weird names or nonmatching names so you guess at what goes together. Ex. you have a staff part but the staff is not called a staff so you don't know where it needs to go. You have to use items in the exact correct spot. You need to open a barrel, you have a spike it doesn't work on the top or the front you have to go to the side of the barrel. Directions for the mini-games aren't accurate or the mechanics don't work well, so I hit skip several times. I like to be able to play a game without having to skip the mini-games and without using the hint button every few minutes just to figure out what to do next in the scene. It was more frustrating than fun.